Dr. Daniel Labow is a renowned surgical oncologist in New York. He got his medical degree from Warren Alpert Medical School of Brown University and did his residency at University of Chicago. 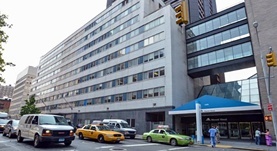 He then went to Memorial Sloan-Kettering Cancer Center and did his fellowship. Dr. Labow is certified by the American Board in surgery. With an experience of over 20 years, Dr. Labow is affiliated with several hospitals including Mount Sinai Hospital. Dr. Daniel Labow has contributed to 3 publications. Berger, Y.,Spivack, J. H.,Heskel, M.,Aycart, S. N.,Labow, D. M.,Sarpel, U.; J Surg Oncol. 2016 Jun 24. Tabrizian, P.,Overbey, J.,Carrasco-Avino, G.,Bagiella, E.,Labow, D. M.,Sarpel, U.; Ann. Surg. Oncol.. 2014 Nov 13.